Failure of blood pressure (BP) to decline appropriately overnight (nondipping) is associated with increased risk. 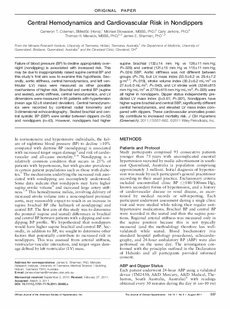 This may be due to inappropriately raised supine central BP and this study’s first aim was to examine this hypothesis. Secondly, aortic stiffness, central hemodynamics, and left ventricular (LV) mass were measured as other possible mechanisms of higher risk. Brachial and central BP (supine and seated), aortic stiffness, central hemodynamics, and LV dimensions were measured in 95 patients with hypertension (mean age 628 standard deviation). Central hemodynamics were recorded by combined radial tonometry and 3-dimensional echocardiography. Seated brachial and central systolic BP (SBP) were similar between dippers (n=52) and nondippers (n=43). However, nondippers had higher supine brachial (13214 mm Hg vs 12611 mm Hg; P=.029) and central (12115 mm Hg vs 11511 mm Hg; P=.024) SBP. Aortic stiffness was not different between groups (P=.76), but LV mass index (33.06.2 vs 29.47.2 g ⁄m2.7; P=.019), stroke volume index (30.26.2 mL⁄m2 vs 27.46.0 mL⁄m2; P=.040), and LV stroke work (3246815 mm Hg ⁄mL⁄m2 vs 2778615 mm Hg⁄mL⁄m2; P=.005) were all higher in nondippers. Dipper status independently predicted LV mass index (b=3.61; P=.001). Nondippers have higher supine brachial and central SBP, significantly different central hemodynamics, and elevated LV mass index compared with dippers. These cardiovascular anomalies possibly contribute to increased mortality risk.